Wow! Zawahiri Is a Democrat! 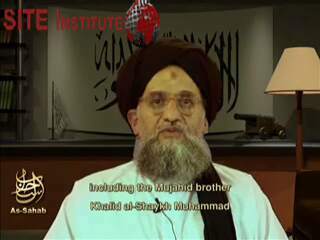 Zawahiri sounds so Michael Moorish… It’s spooky! That’s just the first paragraph! You might as well of read it at Democrats.org! Let’s face it, if you are not noticing the similarity in message… you are not being honest with yourself! To U.S. President George W. Bush, Zawahiri brands him a “deceitful charlatan” and liar, and questions: “why don’t you tell them how many million citizens of America and it’s allies you intend to kill in search of the imaginary victory and in breathless pursuit of the mirage towards which you are driving your people’s sons in order to increase your profits?” He questions his motives for initating the War in Iraq, ridiculing the false prexets under which it was conducted. To this end he cites the purported links of Saddam Hussein to al-Qaeda, and the presence of weapons of mass destruction. He also addresses the capture of Khalid Shaikh Muhammad and questions that if it helped in the “war on terror” then “why are your troops retreating in secrete from the south and east of Afghanistan?… Bush…be aware that the liberation of our captives is a debt on our shoulders which we must fulfill”. Other individuals who have been captured, such as Ramzi Yusef, Omar Abdul Rahman (the “Blind Sheikh”) and Abu al-Faraj al-Libi are also cited. The SITE Institute has the rest. And… Bob Woodard sounds the Zawahiri theme today. Back Talk takes a look at the latest Bush-bashing book. Don’t miss this… The OBL is Still Alive Blame Game and what you don’t know about the Clinton years.